A new study published in the May 15th issue of American Heart and Stroke Association’s medical journal Stroke, suggests that older migraineurs have an double the risk of suffering from silent brain injuries and ischemic stroke than those who do not experience migraines. Silent strokes can be asymptomatic i.e they do not show symptoms but increase the risk of future strokes. 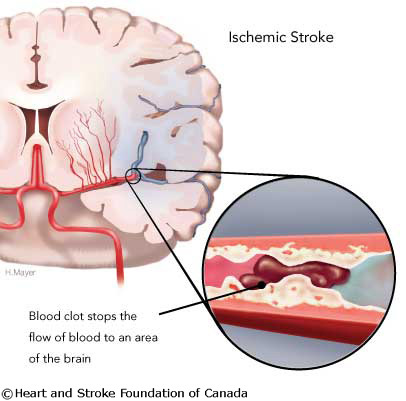 Silent stroke or a silent brain infarction is caused by a blood clot getting into the brain artery and thus interrupting the supply of blood, oxygen and nutrients to brain tissue surrounding the clot thus killing it. He raised caution that if an older migraineurs had other coexisting conditions like a high blood pressure (hypertension) or a sedentary lifestyle, it would add to the risk factor for suffering silent strokes and brain damage. He thus advised them to take medication to address hypertension and to bring it under control. The study was a research on diverse ethnic groups including people of Hispanic and African origin. It was a collaborative investigation conducted by University of Miami and Columbia University. Approximate 40% of the population studied comprised of men. The average age of the population was around 71 years old. 65% of the population under study was of Hispanic origin. Of the 546 studied, 104 had a history of migraines. Risk of silent brain infarctions in those with migraine double even after adjusting other stroke risk factors. Migraines with aura were not a deciding factor in measuring risk of silent strokes. No real increase in the volume of white matter/ Small blood vessel anamolies was associated with migraines. Some lesions came across in radiographic images as having ischemic origins but more research was required to confirm this.